What better way of using up windfall apples! Pick any apples you find in the wild or ask neighbours, friends or family with apple trees if you can pick their apples and give them homemade cider in return. You should now have plenty of apple juice. Put the juice into a demijohn and at this point you can choose to add sugar, about 200g per gallon of juice - this will give the finished result a higher alcohol percentage. You will also need to add 1tsp of cider yeast at this stage. 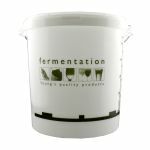 Or if you are making Scrumpy, don’t add yeast, just leave it to ferment for longer and open to the air (it uses natural yeasts in the air to ferment). Put it in a warm (but not hot!) place. Around 20C is optimal. And leave to ferment. When it stops bubbling, the fermentation process should be complete. And you can now bottle. Using sugar may result in a fizzy cider - but no two homemade ciders will ever be the same! Slainge! That's 'bottoms up!' to you and me!